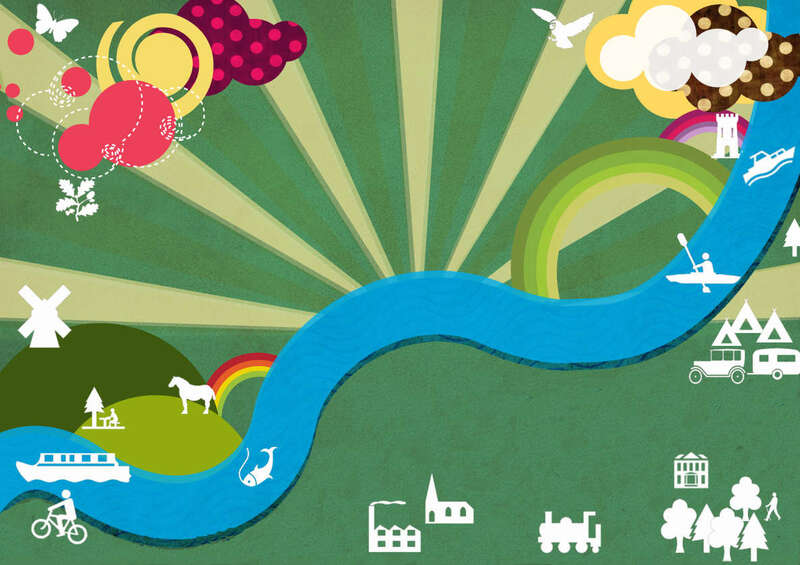 Ahh, greetings fair blog reader* and how goes it? I haven’t had those eyes feast themselves on this here blog for a while so I’m pleased to welcome you back. In the last few months I’ve been going out less on random adventures following brown tourist signs and doing more floating about in the virtual sphere of newspaper archives, Wikipedia, second hand book ordering and surfing a whole host of obscure enthusiast websites researching the fascinating places on this planet that are signed by brown tourist signs. Every day throws up new curious facts and fascinating stories of how some of our better and lesser known attractions came into being and how they continue to enthral us to this day. As much as I’m a sucker for a random adventure and getting out there enjoying the world, being stuck behind this screen when there’s such fascinating greatness to discover via the interweb has helped restore my faith in humanity and my research has filled me with wonder and awe at the downright brilliance of people almost as much as going brown-signing… well, almost. So today I’ve been researching museums for one of the 93 chapters that will eventually combine together into my book-thing entitled “Follow the Brown Signs” (or something a bit more imaginative), and will be sandwiched between the chapters on motor sport venues and National Trust properties, just to put it into context. When I begin my research I always start with the most obvious questions like, where was the world’s first museum? (In Rome technically, when the Pope Sixtus IV donated ancient Roman sculptures to the nation in 1471 and beginning of the infamous collection at Piazza del Campidoglio, now part of the Capitoline Museums complex). And, where was the world’s first purpose built museum? (In Oxford, our very own Ashmolean Museum or “Ashmole’s Repository” as it was when it opened to the public in 1683). Then I start looking for stats; how many museums are there in the world? (Over 55,000 according to the book Museums of The World 2011, going for just £396 on Amazon at the moment). And how many museums are there per capita in different countries? How many types of museum are there? When was the first museum studies/curatorial course offered by an accredited educational establishment? etc. etc. etc…. I find from these first most obvious questions stem the less obvious questions, and the ones that we’re really most interested in answering. Some of the defunct museum tales had happy endings, with collections simply being reallocated or amalgamated into bigger museums but of course some were not so good, however even after reading the most laughably ridiculous ones I couldn’t help feeling sad for the people who had dedicated a large chunk of their lives to the pursuit of sharing their knowledge and passions with others. 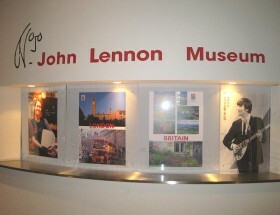 Let us take a moment to reflect and remember The John Lennon Museum in Saitama, Japan, The Ajax Experience, Amsterdam and the Teddy Bear Museum in Hampshire, England, defunct museums everywhere I tip my hat to you. From them all I’ve picked a tale to share with you dear bleader, and it’s the story of the Niagara Falls Museum, in my opinion one of the saddest on the list. Although this museum was the first to open to the public of Canada in 1827 it was actually founded by an Englishman, a brummie no less, who settled in Niargara in 1820. Thomas Barnett was a keen collector of things, he had a penchant for taxidermy and a repository full of curiosities. He collected and taxidermied whatever he could lay his hands on and opened the museum to share his collection of novelties with the Canadian public and visitors to the infamous falls. 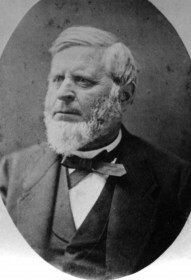 His son Sydney soon got involved and took 3 trips over to Egypt in the 1850s and ’60s to add to the museum’s collection. He returned with 4 mummified bodies and a whole host of other ancient Egyptian artefacts too. 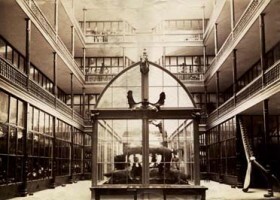 By the mid 19th century the museum housed thousands of exhibits including, in Thomas Barnett’s words “bipeds and quadrupeds, birds, fishes, insects, reptiles, shells and minerals and Indian curiosities, all regulated to delight the eye and improve the understanding and mend the heart”. (Museums do mend the heart, I love you Barnett). The success of his museum however was stiff competition for Barnett’s neighbour, a Buffalo native and hotel proprietor called Saul Davis who became his bitter business rival for 3 decades. Davis and Barnett’s dispute was over access to the falls and control of “The Front” where most tourists spent their time. Both built separate walkways down to the water’s edge and offered “Behind the Sheet” tours (actually walking along a thin ledge behind Niagara’s Horseshoe falls!). The rivals did not share their space amicably and destroyed each other’s stairways by fire and dynamite no less than 3 times, visitors were continually harassed by both parties in an attempt to attract their custom and the reputation of The Front was being severely tarnished. Their war culminated eventually in death when one of Barnett’s staff was killed by Edward Davis, Saul Davis’ son. The rivalry between the men had become so bitter that each had literally taken to throwing sticks and stones at the enemy, so when one night Edward Davis was walking along The Front by the museum a group of Barnett’s supporters began pelting him. In fear for his life he pulled out a pistol and shot one of his assailants, the mortally injured man managed to drag himself back to the museum but died within minutes. Friends and supporters on both sides turned out and a brawl ensued, Sydney Barnett is reported to have stabbed one of Davis’ crowd so badly that he wasn’t expected to survive when the incident went to press. Edward was arrested for murder at the scene but at trial he was acquitted, pleading self defence. The incident made headlines and was reported as far away as California in the Alta California in July 1870 (above), the article highlights just how famous their rivalry had become. As a direct result of this very public feud the Barnetts struggled to keep up the popularity of the museum. 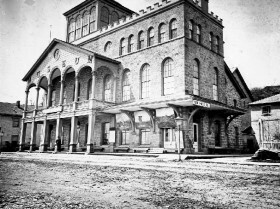 The reputation of the Canadan side of Niagara Falls was at an all time low, not helped by Saul Davis’ shady hotel and tavern (dubbed locally “the cave of forty theives”). In a last ditch attempt to bring in the crowds Sydney Barnett organised a Wild West show starring Wild Bill Hickok but it failed miserably, it was the final nail in the coffin for the father and son curatorial team. By 1878 Thomas Barnett was struggling financially and he was finally forced to sell the museum and the entire collection. In an ironic twist his nemesis Saul Davis bought the whole lot. Barnett died 12 years later and is still widely honoured as Canada’s first “museum man”. Saul Davis now owned quite a museum empire and kept the collection open to the public, even taking pains to move it across to the American side of the falls when the newly inaugurated Niagara Parks Commission planned the Queen Victoria Park over The Front in 1888. Saul continued to add to the collection, including the purchase of 4 more Egyptian mummies. Eventually though the collection was sold to the Sherman family in 1942. History repeated itself again for the museum when the American authorities announced plans to develop a park around Niagara on the site of the museum so Mr Sherman purchased an old corset factory back on the Canadian side of the falls to house the burgeoning collection. Finally in 1999, when the running of the museum became too costly the bulk of the collection was sold to an eccentric Canadian private collector called Bill Jamieson. Jamieson was the “master of the macabre”, a self taught antiquarian with an eye for tribal and rare artefacts. He had a passion for collecting but he was also a very private collector, he was a businessman primarily buying and selling to the rich and famous as well as museums and research facilities. When he acquired the Niagara Falls collection in 1999 he told reporters he wanted to rekindle the spirit of John Barnett, although there were concerns among the museum community that the huge collection, for so long on view and accessible to the public would now be kept behind closed doors and worse, sold off to various private collectors. Four years after Jamieson acquired the collection he did sell some of the collection, the mummies and ancient Egyptian artefacts went to the Michael C Carlos Museum in Atlanta Georgia for $2m. After extensive scientific testing and investigation of the unidentified mummies it was declared that one was in fact the lost remains of Rameses I, the founding Pharaoh of Ancient Egypt’s 19th dynasty and the discovery bought Jamieson world wide fame. The mummies were thought to have been stolen by grave robbers who sold them on to the Montreal businessman travelling with Sydney Barnett in Egypt back in the 1860s. In a gesture of good will the Atlanta museum gifted the mummy back to Egypt where Rameses I was repatriated from his quiet existence in total obscurity next to Niagara Falls to display with full honours at the Luxor Museum. The mystery of what would happen to the rest of the Niagara Museum collection was eventually solved when Jamieson was found dead on his sofa after suffering a massive heart attack in November 2011 on his 57th birthday. He was making a TV series, Treasure Traders for the History Channel about the art of dealing in curiosities and antiquities at the time of his death. A year later in 2012 most of the extraordinary man’s collection was auctioned off to private bidders in a 4-day long sale, and that was the end of the united collection of the Niagara Falls museum. After reading all this I thought about why I was so fascinated with defunct museums. For me it isn’t just that when a museum closes there’s a loss of a centre for learning and inspiration (although that is sad, obvs. ), the thing that worries and saddens me most is the abandonment and breaking up of a collection. In any museum the first thing I want to find out about is the collection, no matter what the subject matter or how it is presented, for me I can only really connect with it if I know who started it and why, and also how it has changed and evolved over the years. Museums and art galleries that tell us how their exhibits and artefacts fit into the greater story of the museum are the ones that captivate me most. There has only been one gallery which did this throughout as as a matter of course and that was the Uffizi Gallery in Florence. Each piece of artwork was detailed and contextualised but there was also a great effort to illustrate how each one fitted into the collection, whether it was donated, bequeathed, bought by the de Medici family or simply on loan, the collection took on a whole new life in it’s own right when I understood the circumstances of its acquisition. The collector’s eye reveal a unique personality, the objects epitomise what really mattered to a person, showing us their loves, their passions and their obsessions. Understanding a collection and learning the motivations behind the collection is the very thing that inspires me, enthusiasm is contagious and I am always on a mission to catch it.